I always need to be improving my skills, and ad copy is the only thing a user will see in my accounts until they get to a landing page. I want to understand what I could be doing better, which means either finding flaws in other ads or new ideas I hadn’t thought of before. I’m going to start with the a very business-centric search query. I am currently located in Dallas, Texas, and Lewisville, Texas is a suburb in a nearby county. 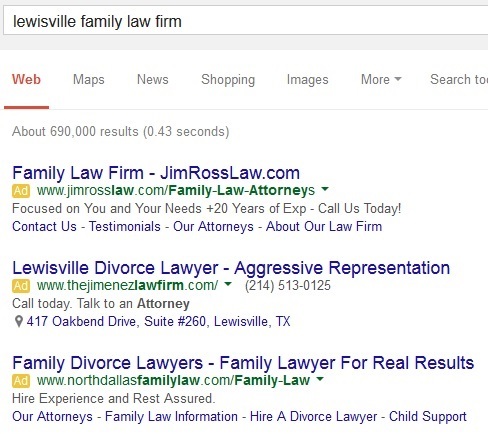 To remove any confusion over what I’m looking for, I searched for “lewisville family law firm”. The screenshot below displays the top three ads. Why The Top 3 Ads? Sure, I could cover the ads on the sidebar or at the bottom. But the ads at the top are often optimized better. Finding ads that are wrong on the rest of the page is like shooting fish in a barrel. I want to have to work to find flaws! To start with, they used capital letters in their Display URL and included keywords in it. Notice that Google made the letters of the words that were close to their query have bold text? The capital letters allow the eyes to distinguish the words clearly. The dashes were an extra step, which sometimes work and sometimes doesn’t. Only the advertiser can tell whether it has worked. The sitelinks are satisfactory but underwhelming. ‘Testimonials’ and some of the others could establish a little trust, but that reads more like website navigation. Does it add value to the user? Well, it does provide an easy way for the user to begin researching the law firm, but nothing more. Since family law includes a variety of specializations, the specialties might have been better sitelinks. The headline is to the point “Family Law Firm”. The ad copy sells themselves as “Focused on You and Your Needs” which conveys that their lawyers are caring and/or attentive. The capitalization was unmistakably chose to emphasize that. Since attorneys have our lives in their hands, this can be a valuable message to get across. “+20 Years of Exp” Is a nice addition, as it feels like the lawyers have a lot of knowledge and will know how to deal with surprises. “Call Us Today!” is a strong Call-to-Action. Pretty good way of packing in couple benefits and the CTA. The law firm itself is in Arlington, Texas, another suburb. This is perfectly fine, but the geography is not explicitly stated any the ad copy. The one extra step of removing the ambiguity could have made this even better by including Lewisville in the copy somewhere. The advertiser has been doing something right in the past. The domain has been shown as part of an extended headline which only happens when the domain appears to carry authority with the user. Also, while the ad doesn’t mention anything regarding cost-effective, high-end, cheap, or otherwise, it would be interesting to see their list of negative keywords in this regard. www.thejimenezlawfirm.com is 25 characters by itself, so this honestly leaves less room to play with. I would have like to see the advertiser utilize a little of this though. They could easily have added /Family or /FamilyLaw to the end. This has the Location Extension and the Click-to-Call Extension. These both are quite handy. The advertiser likely has sitelinks and possibly Call-Out Extensions, but Google has gotten very good at trying to make each ad appear distinct to improve overall CTR’s. The headline includes Lewisville and “Divorce Lawyer”. While this is a sub-specialty of family law, this is fine, as it discourages clicks for family law in other specialties. The advertiser ended their Description Line 1 with punctuation, which allowed the ad to receive an extended headline and the punctuation removed. I love “Aggressive Representation”. It’s very powerful and tells the user they will fight for them. Description Line 2 drops the ball though with “Call today. Talk to an Attorney”. That’s two CTA’s on the same line which is wasted ad characters. Without the “Aggressive Representation”, this would be a very weak ad. Having two CTA’s on Description Line 2 is lazy ad copy. Since the advertiser didn’t take advantage of the Display URL characters, but they clearly knew enough to get the city in the ad, good Description Line 1, and ad Extensions, they would be well-served by spending more time thinking about each element of their ad copy. The business is located in Lewisville. I am curious if their ads have Lewisville displaying for queries related to other cities. While the domain isn’t very short, the advertiser took full advantage of the extra space at the end to get in a keyword or two. The capitalization is worth mentioning as well. As I noted above, this helps the eyes distinguish the words easier. Much like the first ad, these sitelinks appear to be navigation names on the website. They also appear to be a hodgepodge of ideas that were added for the sake of having sitelinks. These could much better. As with the second ad, the Description Line 1 is ended with punctuation, although that punctuation isn’t visible. This allows Google to place it at the end of the headline for an extended headline. “Family Divorce Lawyers” is fine in the headline. “Family Lawyer For Real Results” is rather weak, though not terrible. It’s not nearly as convincing as “Aggressive Representation” on the ad copy above it. “Hire Experience and Rest Assured” makes no sense. Is it a CTA? Is it a benefit? What does it even mean? Hopefully, the advertiser double-checks their ad copy before their client does. With a domain that contains “North Dallas”, I would think adding the word Lewisville somewhere would be important. But, it does depend on the geography settings. Honestly though, this ad isn’t likely to stay in the top three for long. The Quality Score is going to drop as the CTR does. The worst crime is that Description Line 2. Someone, fix it fast! For such weak sitelinks, I’m surprised other ad extensions aren’t appearing instead. As I noted before, I don’t expect this ad to stay in the top three positions for long. Despite the weakness behind ad copy #2, “Aggressive Representation” shown as extended headline clearly packs a powerful punch. While the #1 ad copy is written well all the way around for the most part, I believe it could be beaten by the second advertiser if they took care of the other little things. I need see if I can find some of the loaded messages in other regions or industries that are close to my clients’ to beef up the ad copy that I’ve got.